I had never made cheesecake before. I had heard that it was difficult to make one without having it crack, but I had no idea how difficult it would be. Mine was fine all through baking, but as soon as I took it out of the oven and put it on the cooling rack, it got a small crack in the center. I wasn’t really worried about a small crack, because I knew I was putting caramel sauce and peanuts on it. Then, after letting it sit for a while, I took the springform pan off that it had baked in and my entire beautiful cheesecake SPLIT IN HALF. I quickly stuck the entire thing in the refrigerator while trying to think of someway to fix it. I called Mom and she said I should just cut it into cheesecake bars and nobody would even know. So I did. I think the bars turned out looking fine. I also sent this with Zack to work for his company cookout. Only one little piece was left afterwards, so people must not have been too turned off by its appearance. Everyone said it was really good. 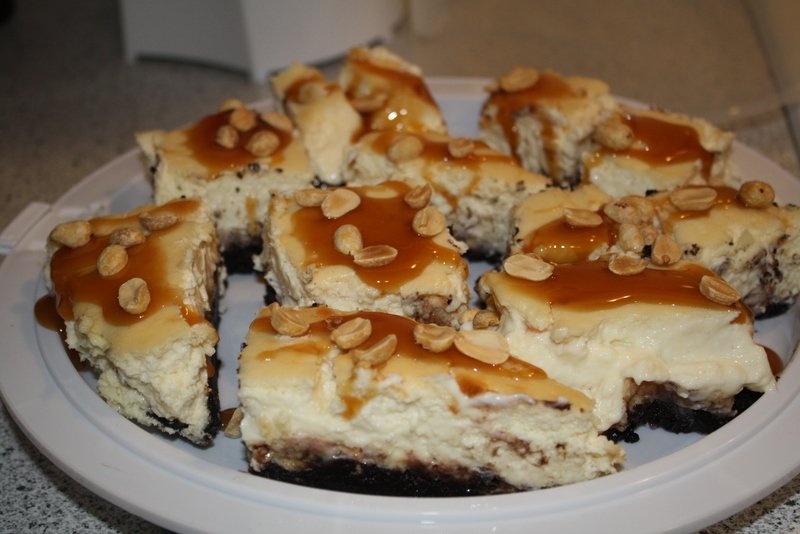 It has an Oreo cookie crust, actual Snickers bars baked into it and then the caramel drizzle and peanuts. 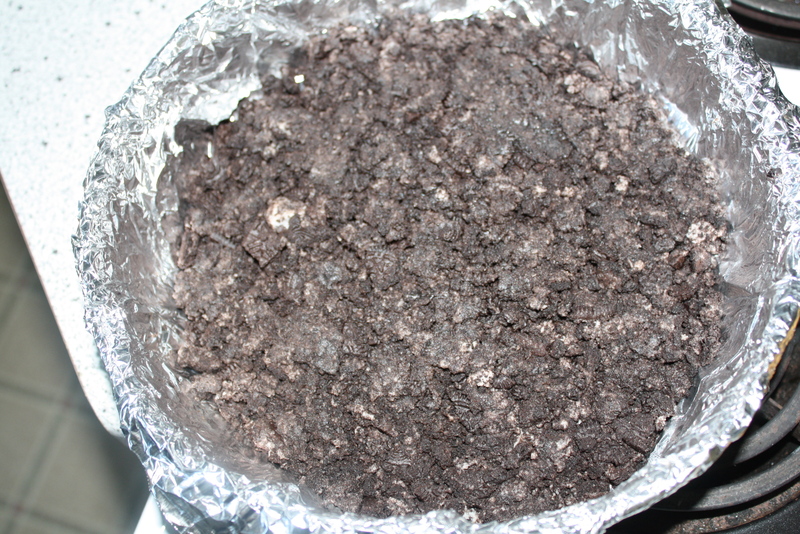 Here’s a picture of the Oreo crust. It looks kind of like dirt in this picture. 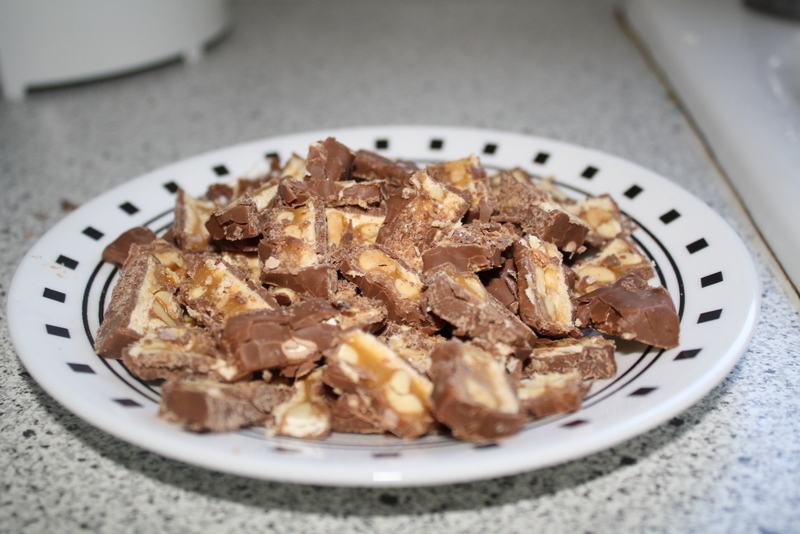 The cut up Snickers bars that went in on top of the crust. See? Not too horrible. I will definitely do some research before I make another cheesecake on how to avoid cracks. Prep: 25 minutes. Bake: 1 hr 5 minutes. Chill: 4 hours. Serves 10. Make Crust: Preheat oven to 350 degrees. Mist a 9-inch Springform pan with cooking spray. Wrap bottom and sides with 2 large pieces of foil. Crush cookies and mix in melted butter. Press into an even layer in pan. Bake until firm, 8-10 minutes. Let cool. Make filling: Place a roasting pan filled with 1-inch hot water on oven’s center rack. Beat cream until smooth. Add sugar; beat for 1 minute. Beat in eggs. Scrape down sides and bottom of bowl. Beat in vanilla, lemon juice, and cornstarch. Sprinkle Snickers over crust. Pour batter into pan; place in water bath. Bake until cake is set around the edges but still jiggles in the center, about 55 minutes. I did some research and this is how it’s recommended to cool a cheesecake: Remove pan to a wire rack. Let cool 10 minutes and take a knife around the edges to release it from the foil. Allow the cheesecake to cool for another hour and then put the entire thing (still in pan) into the refrigerator overnight to fully chill. Then, remove the pan and the foil. It shouldn’t crack that way. zelasty reblogged this on Express yourself. They look great! Loving the idea of bars to make up for the crack! My hubby and I would absolutely love this! He loves Snickers, I love cheesecake! You should make it! Other than falling apart, it really wasn’t that bad to make! 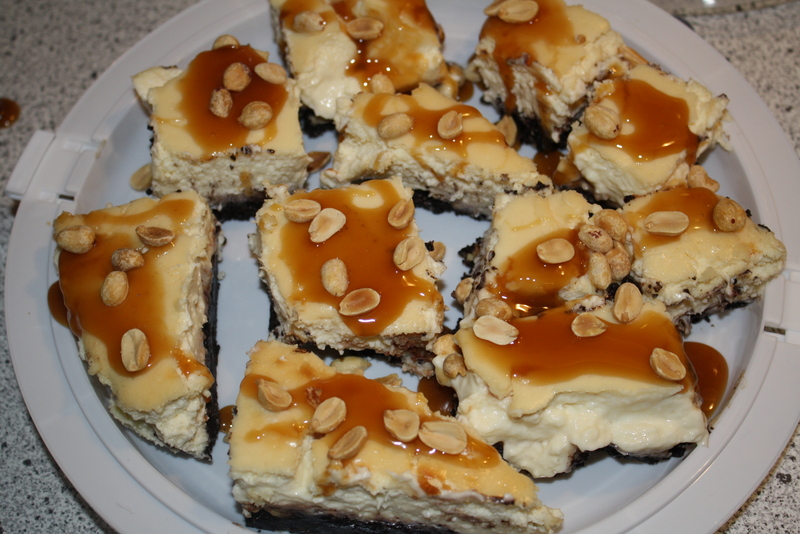 Well, I love Snickers and I love cheesecake so this looks a winner to me!! Yes, cheesecakes are finicky! But yours looks DELISH!